The best cooking recipes to prepare this day of love and friendship. Pamper your partner with a breakfast in bed or celebrate with your best friends preparing chocolate desserts and organizing a dinner with them. Enjoy a great dessert by learning how to prepare homemade cakes such as carrot cake, three-milk "Tres Leches" cake or chocolate cake. Easy recipes with few ingredients. Prepare easy and classic snacks to pamper your guests. From classic homemade chicken wings, a wrapped child and the best recipe for beef carpaccio. The best dessert recipes without an oven, from desserts made in the microwave, to cold desserts and cakes without an oven that will surprise you how easy it is to prepare them. We all think of exorbitant food or the most romantic dinner when it arrives on February 14. Do not miss the opportunity to give the best gift this Valentine made by yourself! Brighten this day with the best chocolate cake recipes that your partner will love. Impress on Valentine's Day with a romantic gourmet dinner. Find the best recipes for valentine's day to enjoy with your loved ones. Learn how to make cookies with these easy and delicious recipes. Find recipes for butter cookies, oatmeal cookies, chocolate and more. If you are looking for the perfect gift in the form of a heart, here you will find delicious cookies up to a heart shaped cake, they are ideal for this Valentine's Day. Prepare some delicious drinks for Valentine's Day, here you will find Valentine's cocktail recipes up to the best drinks recipes for this special day. The best cooking recipes to prepare on Valentine's Day, follow the videos step by step and surprise your partner. Follow the step by step of these videos easy and fast. 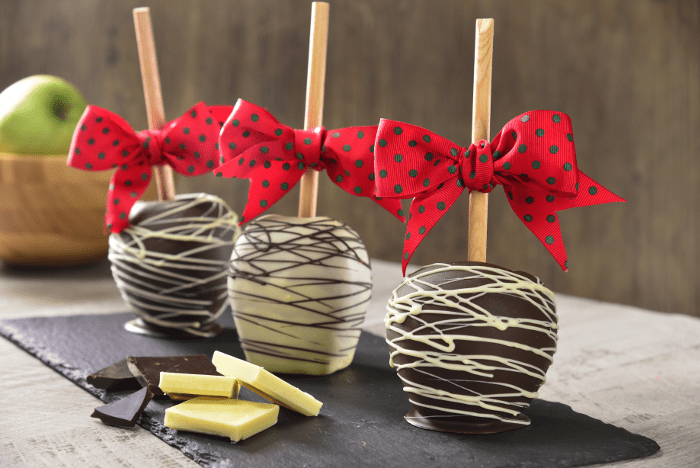 These chocolate covered apples are perfect for any event, and the combination of flavors is amazing. The best of all is that they are very simple to prepare and look great, you can decorate them to your liking. Prepare this dish for Lent or for any weekend, delicious Pasta Alfredo with shrimp. The creamy texture of the sauce is incomparable. A delight! If you love chocolate this is the recipe for you, because with this delicious cake decorated with Kit Kat and fluffy chocolate bread you will delight all your senses. It is perfect for a birthday or to celebrate with the family. Prepare it, do not wait any longer. This dessert known as pastel Dobos, or Dobosh is a delicious Hungarian recipe. It consists of 6 different sheets of cake stuffed with pastry cream. The highlight of the cake is the final touch of the candy. This is the perfect gift to give a bouquet of cupcakes roses, which will surprise that special person, with its fluffy pastries and delicious cheese cover, you will surely conquer it. Enjoy this exquisite red velvet cake very spongy and with an intense red color, with a creamy cheesecake filling. Best of all, it has an amazing presentation with white chocolate chips. It is spectacular! If you prepare this original crepes cake with strawberries and cream, you will want to share it with whoever you love the most. Besides being easy to make, it is very rich because it has layers of whipped cream flavored with lemon zest and strawberries. This rich cheesecake recipe does not require an oven because it is frozen. It is delicious when decorated with raspberries and accompanied by strawberry jam. If this year you want to give the people you most want a nice and tasty detail, we present you step by step how to make some chocolates for Valentine's Day. They are chocolates decorated with Xtremes® strawberry flavor and with a nice paper heart. They are delicious and very beautiful! In the step by step how to make a gift for Valentine, you will find step by step to make a beautiful homemade gift, they are beautiful jars decorated with hearts and filled with delicious Mentos® and Air Heads® Bites. It is the ideal gift for that special person. The best gift you can give to a person that is important to you, is a gift made by you. Here we present you how to decorate some beautiful palettes for Valentine's Day, they are some delicious Chupa Chups® Paletas adorned with some pretty paper flowers. On this Valentine's Day we have the perfect and economical gift, a beautiful decorated frame. Here we present you step by step how to make an original gift for Valentine's Day. It is a simple tip, where with the help of Air Heads® Bites and Mentos® you will create a nice gift.